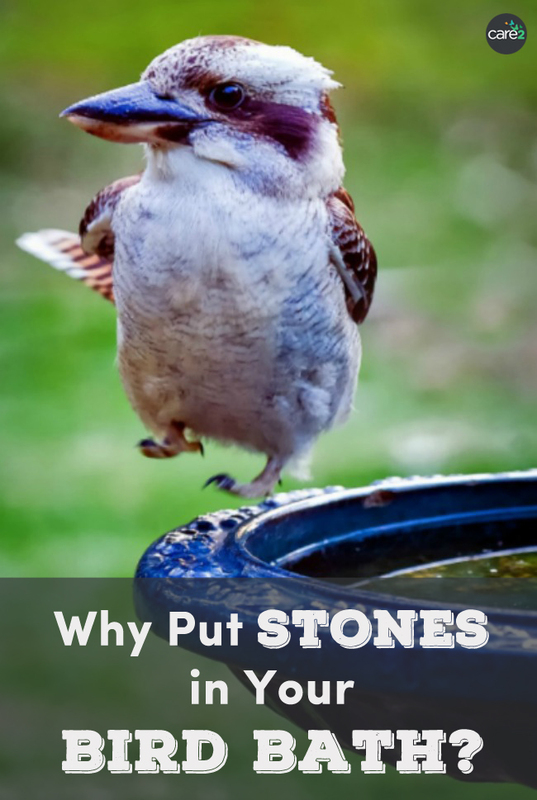 Care2 Causes | Why Put Stones in Your Bird Bath? 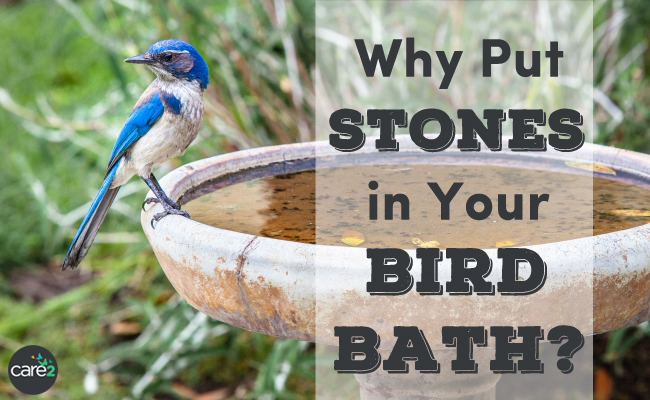 Why Put Stones in Your Bird Bath? Editor’s note: This Care2 favorite was originally posted on June 19, 2014. Turns out that stones in the bird bath are more than just an aesthetic element. In fact, they may even save a life. Crystal, an avid community organizer who has helped place hundreds of throw-away cats, was quick to take action when she sensed danger. I walked over to him and he didn’t even try to fly away so then I thought he was injured. I used a large stick for him to hop on to which he did but then proceeded to try to fly and fell to the ground. He started running away from me. I was able to get him and get him safely into a cat carrier and contacted a wildlife rehabber. Turns out he was just a baby sparrow and got himself pooped out trying to get out of the bird bath because his feathers were all wet and he couldn’t fly. Once he dried off he started flying around inside the cat carrier so I brought him back outdoors and opened the carrier door and off he flew. I’m thrilled that he is okay but can’t help but feel stupid for never thinking that the little bit of water in there might be too deep for a baby bird! The rehabber recommended that I put a couple of large stones in the bird bath so that smaller birds can get themselves up on top of them to dry off and get their bearings again. Perhaps other people know this, but I figured it was worth sharing for those of you that do have bird baths so that if you haven’t you can also consider making them safer for the smaller babies. Crystal hopes that her experience will help others protect fledgling birds in their yards. Best also to keep bird baths and the stones in them cleaned regularly to prevent the build up of algae and likewise for bird tables and feeders. It is also best to situate bird baths and feeders away from open areas and close to trees and hedges, so the birds are not too exposed and can quickly find protection if they feel threatened. To protect birds while feeding on the ground or at ground level, it is also worthwhile keeping the lower part of shrubs trimmed so that cats or other predators can't hide behind them unseen. 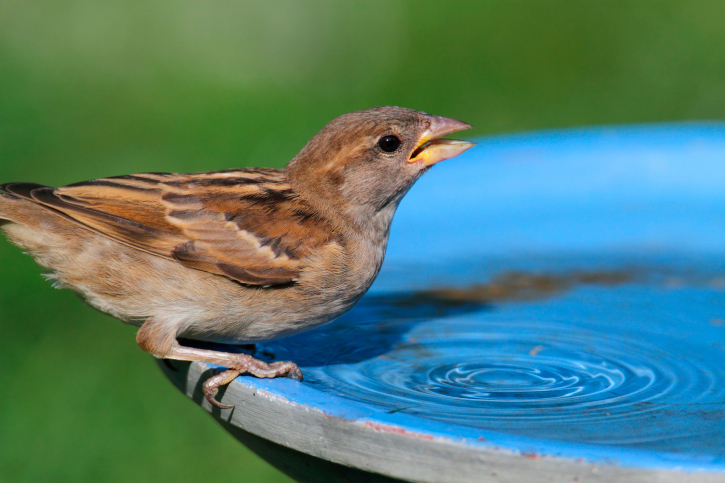 Birds also need a fresh supply of water in the winter as although its cold it can still be dry or any water supply frozen. Birds also still need a regular fresh supply of water in cold dry and freezing weather in winter.